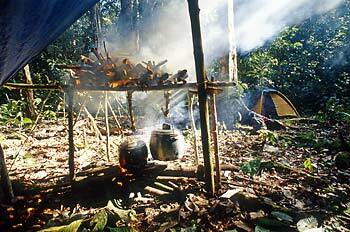 We set out to the forests of Borneo to try to find a tribe of nomadic Punan hunters. It was our first expedition of this kind and it basically meant the transition from my ’normal’ travelling (backpacking) across continents to focused and specialized expeditions. 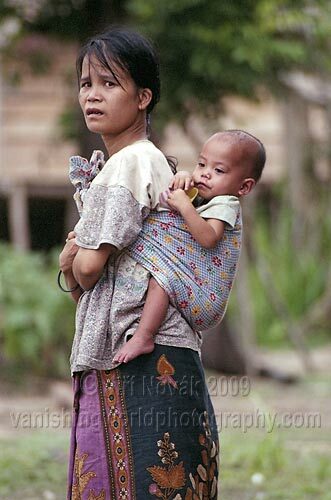 We made the expedition to Kalimantan (the Indonesian part of Borneo) in 2004; it took us far up Kayan River. 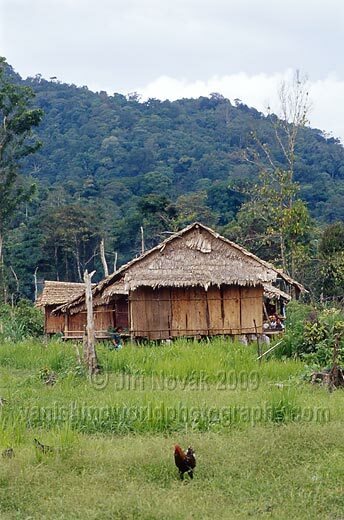 After several days of travelling by motor boats and canoes upstream, we came to the last Dayak village. (Dayak is the collective name for the original inhabitants of the interior of Borneo, although they once lived mainly along the coast, but they were long ago pushed far inland by the Indonesian immigrants.) 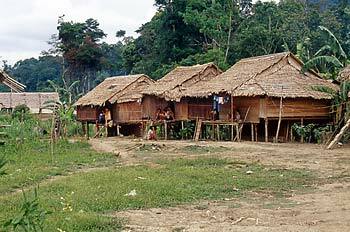 Until this village we had heard only vague reports and stories about the Punan. Here we finally got lucky. The village chief, Pak Jalung, came to us because he had heard that we were looking for the Punan, and he told us that purely by chance he knew where they were because a few days ago two boys had come out of the forest to exchange the raw rubber for sugar with him. He offered that if we wanted to see them he would happily lead us to them. Although he could not understand, why anyone would be interested in visiting the ’primitive dirty forest people’, but if that is what we want, then why not. Then we had to negotiate the price, which is something I am never looking forward to in such a remote area because it is usually very problematic and the initial prices are often astronomical. Also, we had to discuss how far it was and how long it would take us to trek there (to us, not to Jalung, himself an experienced hunter from the forest), how much food we needed for the journey and where would we get it. To my surprise, Jalung asked the lowest possible price for himself and his helper/porter. He fortunately had enough rice and noodles (our typical ’expedition’ meal in Indonesia) at a very reasonable price too (he owned the only motorised canoe in the village and used it to bring supplies from a bigger village two days downstream). It was supposed to be quite far, two days for the Punan, for us maybe five. Through the primary rainforest and without any trails. We took with us twenty kilos of rice and lots of noodles. Our guides also took their hunting rifles. They also had a very interesting system with our food supplies for the return journey, one I had never seen before or ever since. Because we were going to return the same way, at each place where we set up camp our guides left part of the food hanging out of reach of animals. It worked perfectly. The journey itself brought us some very interesting recognition. For example, neither Jalung nor his assistant have ever met a tourist before, they were probably not even aware that tourists exist; and so they did not really know what to expect from us or how to deal with us in the jungle. When we were organizing the food we explained that we are vegetarians. However, we could not expect the hunters from the village on the edge of the forest to understand that. We arrived to the Punan on the fifth day. It was a wonderful feeling to emerge from the forest to a clearing, where they had their camp. My dream came true. 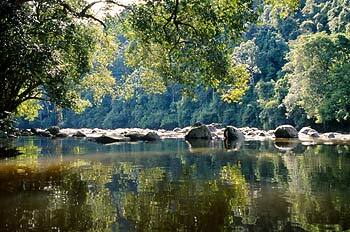 However, even in the heart of Borneo, the big changes are happening. The government had long been forcing the Punan to settle in villages. Clan, which we visited, was (until very recently) one of the last ones still keeping their original hunter-gatherer way of life. 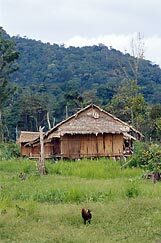 Eventually, they also gave in and set up a semi-permanent village, but occasionally they leave and spend long periods of time in the jungle. In the villages they are then forced to agriculture (and the Indonesians will then happily cut down their forest), but the hunter-gatherers do not like that much and so we saw them mostly just lethargically sitting around all day. Instead of the traditional loin cloths they wore dirty and torn T-shirts with pre-election slogans of Indonesian political parties. Also the local government recently donated them a couple of solar panels as a part of its ’civilize the savages’ program, and so there were the light bulbs in the village on for 24 hours a day. 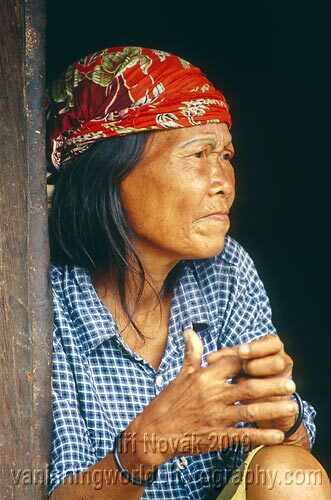 If there were still any completely nomadic Punan clans in the rapidly shrinking forest of Borneo they did not know. Neither they, nor Pak Jalung. My answer usually is that also no-one should force them to live, instead of in the forest, as beggars on the margins of the society, which is the only thing that our civilization offers them. When visiting the Punan, who only very recently had to reluctantly accept the ’progress’, it was particularly striking to us how much they had lost and how little they are gaining in return. In the jungle they are kings and can find all they need to live, in the village and town they become poor beggers dependent on the government and international aid. Also worth mentioning in this context are the Malaysian Penan (as the Punan call themselves in the Malaysian part of Borneo, the Sarawak). 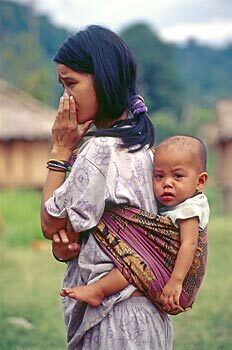 They have been known for many years for their strong opposition against logging of the forest, which is their home and source of livelihood. They are blocking the roads so the loggers with their machinery could not get into the forest, and protesting against the construction of water dams, which would affect the entire ecosystem. Will we finally start to listen, instead of thinking that we know what is the best for them? I'd like to thank Pak Jalung and his friend for guiding and teaching us so much about the life in the jungles of Borneo.